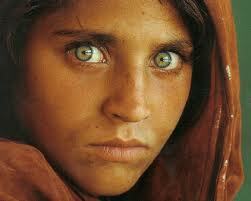 My heart bled as I read the stories of the inhumane treatment of Afghan women in the National Geographic last week. The content was such an eye opener that I decided that, over the course of the next two weeks I want to take the opportunity to highlight the plea of women in that part of the world; they have been torn with fighting and wars over the past 25 years. Women in this war torn country of Afghanistan are looked upon as chattel, by the male dominated authoritarian(Pashtun) Society, where they are forever under the constrainsts of poverty, lack of education, and tribalism. They are subjected to abusive husbands; forced into marriages in some instances with men who could be old as their grandfathers or young as boys in junior high school. They are often left voiceless, and if they complain or attempt to run away, they can be killed, imprisoned, terrorized into submission, or maimed, as has been happening over the years. This is no way that any person should be treated. As a woman, it pains me to realize that this type of barbaric treatment is still allowed to happen in this world. I feel obligated as a woman to raise awareness to my sisters a world away. I invite all readers to share this on their blogs, or with their friends. This type of barbaric, inhumane treatment of women needs to stop. In the next two weeks I will highlight some of the challenges these women undergo, while proposing a few solutions of my own to raise awareness on such an important issue. this so sad, i feel so bad for these people. as a woman, i share their pain, and sympathize with them. i pray for them, that they may be healed, and their sorrows be turned to joy. Amen. It pains me as a man to hear this. What's more sad, is that some of this happens right here in this country, just not as prevalent or publicized. But in many of those cases, the woman usually settles and accepts that kind of treatment as if it were the norm.I just hope a beautiful woman like you doesn't settle for anything less than a man that will treat you like the queen that you are. I look forward to getting more information about these women. This is very very sad. I think that the way those women are treated is terrible. More opportunities to have a voice should be afforded all women. Kudos to you for raising awareness to this issue. Thank you for stopping by yesterday and linking up to our linky. This music is so beautiful. I know of this issue a little, and I think it's so barbaric the way women, and just human beings are treated over there. They're still living in the stone age as far as I'm concerned. Following you. I agree with you Patrice that women in the parts of the world that you mentioned are treated inhumanely in this modern age. I think that as a people we should come together and make a great effort to change some of these practices. It may be difficult because of the longstanding history of these societies, but, it is a worthy cause. Great topic for a persuasive speech. I will definitely use this topic to highlight the plea of women in Afghanistan. Wow! this is powerful Patrice. I must commend you for taking the time to highlight such an important issue. Misogyny in any part of the world is terrible. I empathize with women living under such terrible circumstances. Hopefully, spreading the word through social networks may help to save some women from the heavy hands of their spouses. Thank you all for your feedback and additions. As was stated I will be highlighting more on this topic. As a woman, this hurts me to know that this is happening to our sisters worldwide. i look forward to your future postings. i find this disgusting and horrible that these woman don't have a voice in this day and time. Live, inspire, and show others to do the same. This really touched me. I am happy that someone is taking the lead on such an important issue.